It's not a secret: ASUS likes to roll out many (and we mean many!) variations of the same laptop. However, while most of the time the differences between the various model numbers -- the PEs, PNs, UCs, UFs, etc. -- usually don't result in much, the $430 1015PN happens to be quite a system in comparison to the many other 1015 or 1215 models roaming the universe. Sure, it has the same chassis as the 1015PE we reviewed not too long ago, but inside it's the first netbook to have Intel's brand new dual-core N550 processor and NVIDIA's Ion graphics. It's arguably the most powerful 10-inch Atom netbook to ever hit the market, but there's one thing that kills the experience for us. Find out just what that is in our full review after the break! 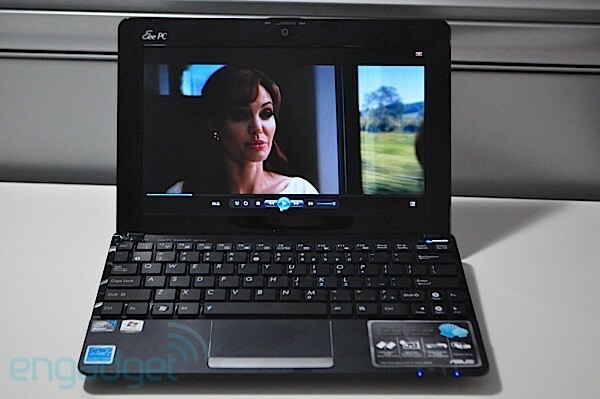 How would you rate the Eee PC 1015PN? 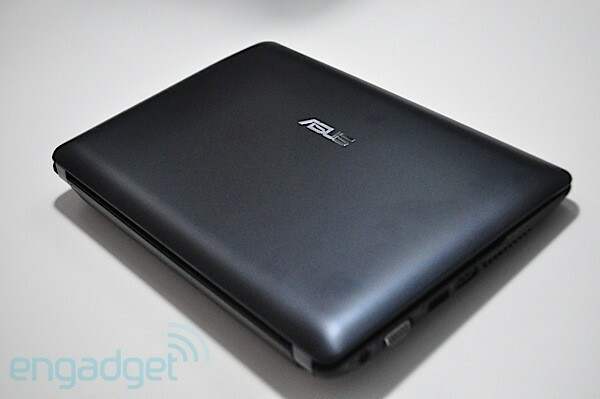 If you've laid eyes on any of ASUS' recent "Seashell" netbooks, the 1015PN will look extremely familiar. It's got the same soft-to-the touch lid as the 1015PE and 1215N as well as the same chassis design. We're happy to see that ASUS exterminated the traces of glossy plastic around the exterior of the system, however, there are still some glossy surfaces that didn't make the cut -- the wide screen bezel and keyboard deck still love fingerprints. Obviously, we still prefer the thinner design of the 1018P, but even despite the 1015PN's thicker base, the 1.4-inch / 2.8-pound machine still fits into a shoulder bag with plenty of room to spare. The six-cell battery does protrude, but it actually props up the keyboard rather nicely. You get what we are saying here: the design is pretty ho-hum at this point, and its probably time for a refresh, but for $430 it's what most will expect. Surrounding the netbook are three USB ports along with an Ethernet, HDMI, and VGA jacks. 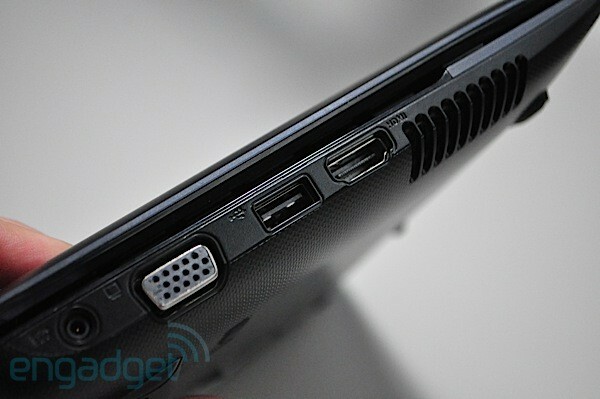 The right edge holds a 4-in-1 media card reader, a headphone and mic / headphone socket. The overall build quality is pretty standard for a plastic ASUS system -- it feels like it could withstand it's fair share of bumps and bruises, but it's still feels like a toy in comparison to something like a Nokia Booklet 3G or the 11.6-inch MacBook Air. 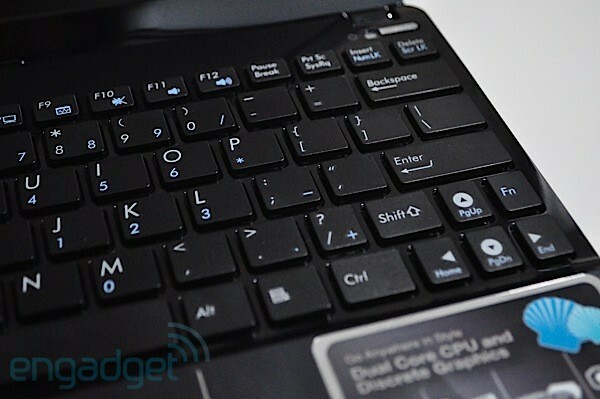 The chiclet keyboard on the 1015PN is identical to the that on the 1015PE and, for that matter, most of the other netbooks we've seen from ASUS in the past year or so. The matte keys are comfortable and provided nice feedback when typing the brunt of this review. With that said, the shrunken right Shift key still trips us up, though it's something you'll probably get used to. The panel doesn't flex nearly as much as that on the 1215N, but it's still got a slight bend to it. As we've said before, it's not the best netbook keyboard out there -- that prize still sits with Toshiba's Mini NB305 or HP's Mini 5103. The wide touchpad is coated in the same smooth plastic as the lid and palmrest -- it's not as fun as the one's with raised dots that ASUS used for awhile, but it's still quite comfortable on your index finger. Multitouch gestures, such as pinch-to-zoom and two-finger scrolling, do work, but are expectedly jittery and flaky. The single mouse button is a bit mushy, but it's certainly better than the rock solid one we saw on the 1018P. If the 1015PN and the 1015PE were put in a police lineup, we'd be able to tell them apart by one thing and one thing only -- the 1015PN's matte display. Yep, the 10.1-inch, 1024x600-resolution LCD isn't coated with a distracting gloss layer, and its pretty great. We actually happen to think that actually improves the viewablity of the panel at most angles -- we didn't have any issues discerning colors when we tilted the screen back and sharing the bright screen with a friend was no problem. And because you never know who could be watching you, the 1015PN has a VGA webcam with a slide-over camera cover. The speakers on the bottom front of the system are typically tinny, but still loud enough for personal listening. We assume this is the part of the review you've really been waiting for, considering the real reason to buy the 1015PN over the other models out there is its new 1.5GHz Intel Atom N550 processor and NVIDIA Ion graphics combo. As we said in our review of the HP Mini 5103, which is powered by the same dual-core processor for netbooks, the everyday performance feels slightly faster thanks to the extra core, but it's not much faster by any means. We actually think the Atom D525 in the 1215N felt snappier, though it also comes with 2GB of RAM. However, the system and its 1GB of RAM was still able to keep up with our usual netbook chores -- including writing this review in WordPad, surfing the web in Chrome, and chatting in Trillian -- there was just the typical netbook lag when opening programs. Unscrewing the small panel on the bottom of the system and upgrading to 2GB of RAM will probably speed things up a bit more. The 1015PN has a 250GB hard drive and 500GB of ASUS' WebStorage. Notes: the higher the score the better. For Ion 2 netbooks, the first number reflects score with GPU off, the second with it on. Of course, the CPU doesn't have to do it all on its own, and the discrete NVIDIA Ion graphics sure do help with graphics intensive stuff, like streaming Flash video at full screen, watching local HD content and light gaming. Like we saw with the 1215N, the benchmarks topple Intel's integrated graphics and rival AMD's ATI Radeon HD 4225 platform, which we've seen in similar systems like the Acer Aspire One 521. You will notice that the 1015PN didn't score as high as the 1215N on the 3DMark06 -- besides the 1215N having a faster processor it also has a faster version of Ion that's meant for larger 11.6- and 12-inch systems. Still, with the discrete GPU turned on, the little machine had no problem not only playing a 1080p on its screen, but also on a 40-inch HDTV when we hooked it up via HDMI. If gaming is your thing, the 1015PN managed to let us grab a gun and shoot around in Battlefield Heroes at 28fps. Although, we should note that loading up this game and World of Warcraft was sluggish -- the processor just wasn't made for this sort of thing. However, it's that task of actually turning on the GPU that has us all worked up. Yes, that's that major pain point that you've been waiting for. 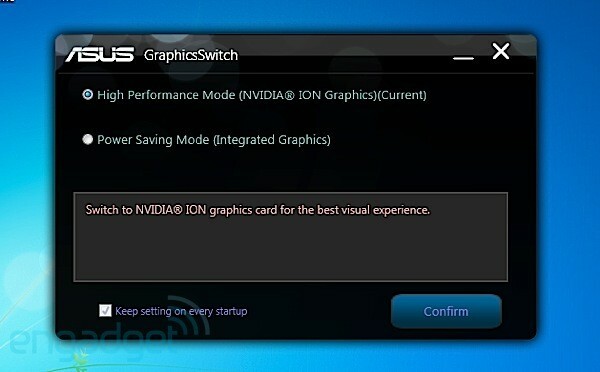 While the next generation of Ion includes NVIDIA's Optimus, which should automatically switch between the integrated and discrete graphics depending on what program is being used, the 1015PN doesn't support Optimus because it runs Windows 7 Starter. (Apparently Starter doesn't allow for that sort of dynamic switching, and ASUS decided to use the OS to keep the cost down.) The result is a very dated experience, which requires you to select the graphics setting you want through that software panel above, and then reboot every time you want to make the switch. It's that two minute (one minute 30 seconds to be precise) rebooting process that really gets us since we don't remember the last time we had a laptop that required us to shut it down to just switch the graphics processor -- log out maybe, but actually shut down? It's been awhile. It works, and gets the job done, but we just wish we didn't have to go through the trouble, and our guess is that many will feel the same way and probably never end up switching graphics modes. Ultimately, that means that you lose the benefits of longer battery life, which is a pretty big bummer since when the Ion GPU is on, the netbook's six-cell, 56Wh battery only lasts around four and a half hours on a charge. Obviously, switching to the integrated lengthened the runtime, and on our video rundown test, which loops the same standard definition movie at 65 percent brightness, the system lasted 5 hours and 53 minutes. Of course, that's not bad in comparison to the 1215N's five hours and 42 minutes, but it's shorter than the HP Mini 5103's six hours. We should also mention that the system gets slightly hotter than other netbooks we've tested -- the left vent blew out warm air more often than not and the bottom left side of the machine warmed up our leg. Because somebody refuses to turn on the heat in our office we didn't necessarily mind it, but most people have heat, right? Unsurprisingly, ASUS loads up the machine with proprietary software and some other stuff, including CyberLink's YouCam software and a shortcut to Bonigo's WiFi service. Along with the typical EeeDock, which is locked to the top of the screen, the machine comes with ASUS' Splendid photo editing software and some new Games Park suite of downloadable games -- the preloaded Chicken Invaders 2 game is actually quite entertaining. It also comes with a VIBE Fun Center, which we'd describe more as slow than "fun." It took over a minute to launch the software and then about another minute to access the library of music and video content. There's also ASUS' ExpressGate Cloud instant-on OS, which you can boot into by pressing the lighting button above the keyboard. Sure, the 1015PN differs from the other 1015 models out there, but we just wish it were more like its larger 1215N brother. While the 1015PN has a smaller footprint and slightly longer battery life, its processor just isn't as powerful and having to reboot every time you want to switch between graphics cards is a serious inconvenience. If you must have a 10.1-inch netbook with solid graphics, the 1015PN is still one of your best bets since there isn't much else out there -- there's that $330 Acer 521 with AMD's Neo II and ATI graphics, but we're just not big fans of its build quality or design. (It makes us wonder why ASUS didn't just throw an AMD Neo processor in a 1015. Of course, there is the 1015T, but that has a slower AMD V105 CPU. You know you want to throw another one on the production line, ASUS!) Honestly, what we'd really suggest is either settling for an underpowered 10.1-inch netbook in the $350 range with a Broadcom Crystal HD accelerator (i.e. the Eee PC 1005PR or HP Mini 210) or spending $70 more and going up to the larger 12.1-inch 1215N.